Just a quick post for Em over at snowingindoors.com. 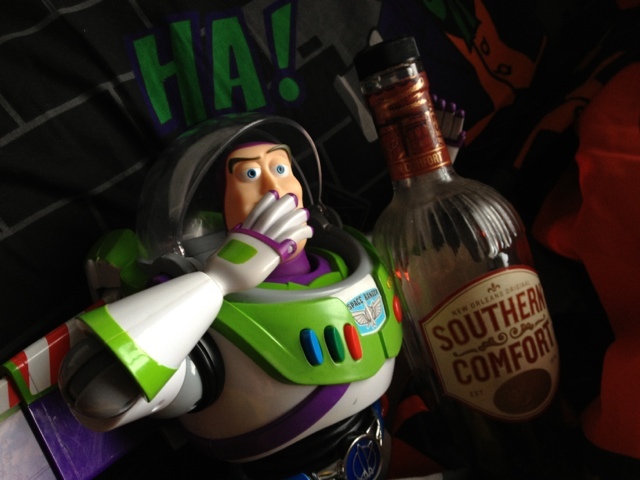 On our recent post for Thetoadstool.co.uk about our Haba picnic we were having, Em pointed out that when Buzz lightyear came over to 'chez snowingindoors' for a picnic he had a bit of bad behaviour. I didn't want to Include this picture in the post as i was ashamed but actually Mr Lightyear did act quite inappropriately. Turns out on both occasions he made it clear that alcohol is bad and should not be brought to these kind of get togethers. Tut tut!